Royal Enfield is one of the few motorcycle brands in India that is always looking for adventure. And their love for the Himalayas is universally known too. From the renowned Himalayan Odyssey to the White Out with the Himalayan, a lot of their adventure stories have been written in the Himalayas. Taking it to the next level, the company flagged off the Himalayan Heights winter bike expedition yesterday. This expedition takes 11 riders from Leh to the Karakoram Pass – a journey that hasn’t been explored by any motorcyclist before. General Officer Commanding 3 Infantry Division, Maj Gen Sanjiv Rai, SM, VSM flagged off the Himalayan Height winter bike expedition Karu Military Station. 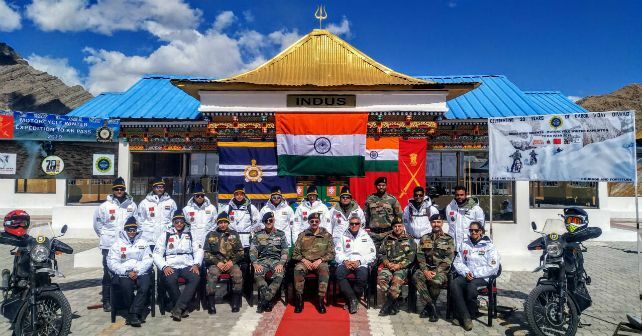 The expedition is led by Indian Army team comprising riders from Army Service Corps, Royal Enfield, and Himalayan Motorsports. It will take the riders a total of 14 days to cover a near 1000 kilometre journey to the Karakoram Pass. On successful completion, this adventure will make its entry into the record books. The team will brave extreme climate and unforgiving terrain on board the Royal Enfield Himalayan. The Himalayan is powered by a 411cc single-cylinder fuel-injected motor that pushes out 24.5bhp and 32Nm. The long-travel suspension and the upright riding posture should make the Himalayan ideal for this kind of an adventure.